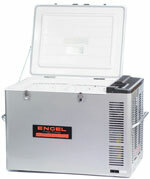 Engel Compact 12-Volt AC DC Refrigerator Freezers feature ROCK SOLID ENGINEERING, Low Power Consumption and Long Life. Only 1 moving part. Most reliable compressor in the World today. Engel, a Trusted Name in Durability, Superb Performance and Longevity. We Will Match Any Price: We will NOT undercut anyone else's price to respect Engel's MAP pricing on these extremely rugged and high quality 12-Volt Refrigerator Freezers. However, should a stocking competitor violate their Engel Agreement and advertise a lower price, we will match that price. Don't forget to include the shipping. A Real 12 Volt Fridge Freezer a little too much for your wallet right now? Try an Igloo or Coleman 12-Volt Cooler. 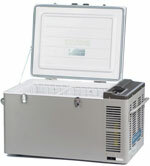 Engel 12 Volt refrigerator-Freezer is a Medium-sized powerful unit, capable of freezing almost anything. 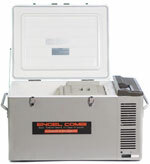 Engel uses the latest generation of compressor technology but draws low power consumption. Includes both 12-Volt and 120 Volt Cords so you can Run your Engel from Vehicle or Household Current. Backed by a Full 2-Year Warranty. Powered by Engel’s latest horizontal RC40 compressor. 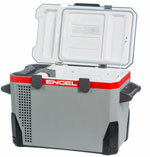 The Engel Drawer Fridge can refrigerate or freezes down to 14° or 10° C.
Refrigerates/Freezes down to 14°F or -10°C. Auto Switching between 12-24 Volt DC. Built-in ventilation with dual fans. Medium-large Engel MR040 12-volt refrigerator-freezer comes with a classic Beige/Black designed weather resistant all plastic exterior. It features a conveniently reversible lid plus a cord storage tray under it. 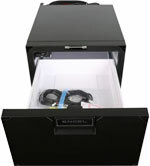 Highly durable fridge-freezer with large rubber bumpers at bottom for protection. The portable unit offers spacious capacity so your group of friends could use one for a long road trip. Engel 34 Quart Platinum Features a user friendly digital controls, built-in battery monitor and an auto switching capability that eliminates the need for the user to switch power sources manually. The Engel platinum 43 quarts features an auto switching capability, a user friendly digital controls, built-in battery monitor and a thermostatically controlled fan. The Engel MT45F-Combi Fridge & Freezer includes the user friendly digital control with LED display. Supplied with both cords, the 12V cord that plugs straight into your vehicle's adapter socket and the 120V lead with three pin house plug. Size: Inside 15.4" x10.8" x 16.4"
The Engel MT60F-COMBI is a powerful combination fridge and freezer with extra large capacity 64-quart. Made up of two separate compartments, refrigerator and freezer. The fridge compartment is fixed at 40°F while the freezer compartment features variable temperature regulation from 40° down to below 0°F. Refrigerator has 34-Qt Capacity and Freezer 26.5 Qts. Extra large Engel 12-Volt Refrigerator Freezer is ideal for long term storage in remote areas where the convenience of ice and cooling is hard to come by. Load this portable unit with supplies as it is capable of freezing almost anything. 12 Volt and 120 Volt Cords are also included so you can plug your Engel in your car or RV as well as from a household current. A little large for use by the average Trucker, unless they own their Truck and need the larger size. Built tough for the harshest environment, the Premium Engel Fridge-Freezer MT80F is trusted in long term freezing with a gigantic 84 Qts or 79.5 L capacity. Also used by Reps on the Road for Frozen Product Samples, RVer for Keeping Frozen Dinners, and Off-Grid for that extra needed room. Buy now and Get 1/2 Paid Freight Included. 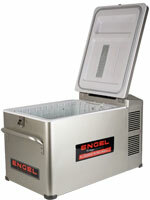 Engel's largest dual voltage freezer!